Here’s a little item that slipped in and out of my brain over the last few weeks: FFG have announced they are releasing a revised edition of the Arkham Horror Curse of the Dark Pharaoh expansion sometime this spring. As a self-described “Arkham-Whore” I admit I was a little taken aback by this announcement. Dark Pharoah is by far my least favorite of the small box AH expansions, it just didn’t seem to really work all that well with the game. Apparently, I wasn’t the only one who thought so. 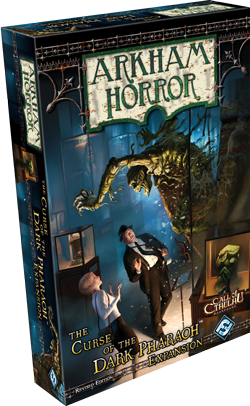 It “…came to become the one that deviated most from our later Arkham Horror design vision and over time came to stand apart from the Arkham Horror family as a whole.” So, a proposed fix, though this sounds more like it was completely dismantled and rebuilt. Most intriguing to me are the enhanced presence of exhibit artifacts, which rarely, if ever, were accessible in the original release, patrolled neighborhood tokens, and benefit and detriment cards.Yeah, so I'll buy it.